In 1994 John Walden and Eagle Mountain Properties purchased the land that is now Eagle Mountain in a bankruptcy sale. Initially they were mostly interested in the water rights, but he eventually partnered with others to develop a city. By 1996 the city was incorporated and boasted a population of 250 people! The city has been rapidly growing ever since, at the 2008 census it was estimated that Eagle Mountains population was around 22,309. Mountain Ranch Bike Park – Mountain Ranch Bike Park is the first of its kind on the Wasatch Front. It spans 30 acres and features three jump lines, a slope style track, a single track, a skills area with 200 yards of wood features, a teeter-totter, a pump track, a beginner trail, and an uphill trail. Eagle Mountain boasts two things that are hard to come by in Salt Lake County real estate and Utah county real estate – newness and spaciousness. 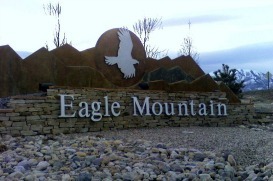 Since Eagle Mountain was incorporated only fifteen years ago all of it’s services and facilities are relatively new. Parks, homes, libraries, stores, etc. everything has a newer feel to it, and lots of people enjoy that feel. Likewise, Eagle Mountain is just in its infancy and as such there is lots of room to grow. If you are hoping to secure some acreage, Eagle Mountain has the space to invest in. This is also appealing because Eagle Mountain is near major thoroughfares (like I15 and Redwood Road) but removed enough to feel like you have some breathing room, unlike many areas of the valley. Another draw to the Eagle Mountain area is the vast amount of outdoor recreation opportunities available. The natural landscape supports running trails, hiking and biking, not to mention a golf course and ATV-riding. Contact us today to learn more about city specific programs that can provide you with help to make your dream of owning a home in Eagle Mountain a reality. The Red Sign Team has been helping people interested in buying or selling Eagle Mountain real estate for years. Our experts are familiar with the market trends for Eagle Mountain and Utah real estate in general. We are confident that we will be able to provide you with the friendly, knowledgeable, helpful and experienced real estate service that you deserve. Contact us today!